← Milk Duds – 86 Years and 40 different packages! Yesterday I covered a pretty big swath of Milk Duds history through the lens of the vintage packaging in my collection. Today, I’m going to look at a very specific niche of Milk Duds history – the exotic and little-known area of Milk Duds’ brand extensions. These brand extensions include the oft-discussed, mythical “flavored Duds” of the 1970’s, plus two others that I’ve never seen mentioned anywhere else before. 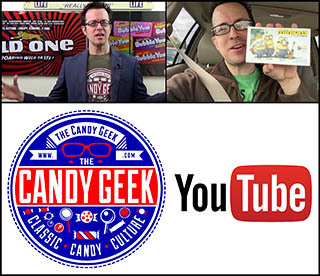 As this is one of my favorite sub-genres of candy collecting, I can’t wait to kick it off — so make the jump and join me for an awesome piece of Milk Duds history! I’d first read about fruit-flavored Duds on the CandyWrapperMuseum site of my pal and fellow collector, Darlene Lacey. She shares a colorful story of encountering an array of flavored Duds at a store one afternoon, but only picking up the grape flavor, expecting to find the rest later on. The only problem is she never sees them again. I think it’s safe to say that Darlene’s tale and the image of her Grape Duds box inspired my initial appreciation for the oddball Milk Duds offshoots. It’s an appreciation that has only grown as I’ve uncovered more information about them. 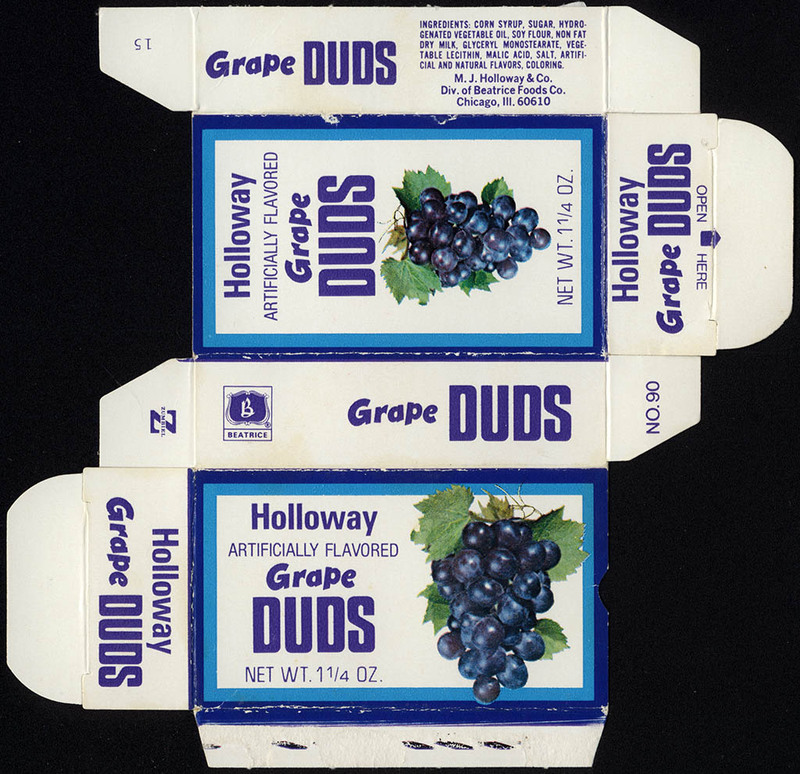 Though the Grape Duds was the first flavored Duds box I encountered, the first one to join my collection was a different flavor – Strawberry Duds. The origins of how this box came into my collection are a bit unusual: A fellow cereal box collector was redoing a bathroom and during the demolition phase, found the Strawberry Duds box tucked behind the wall – having rested there safe through the decades. I’d imagine it was a snack for one of the original builders, finished and set upon a beam – sealed in for unintentional preservation. So it was that for the past several years, my collected knowledge of flavored Duds came down to two boxes – Grape and Strawberry. A blurry look at fruit-flavored Duds, circa 1975. The mystery of flavored Duds had continued to build for me over the years. I’d hear others recall faded memories of encountering Banana, Cherry, Apple, and even Maple Duds – though it was hard to say what was real and what was pure imagination. 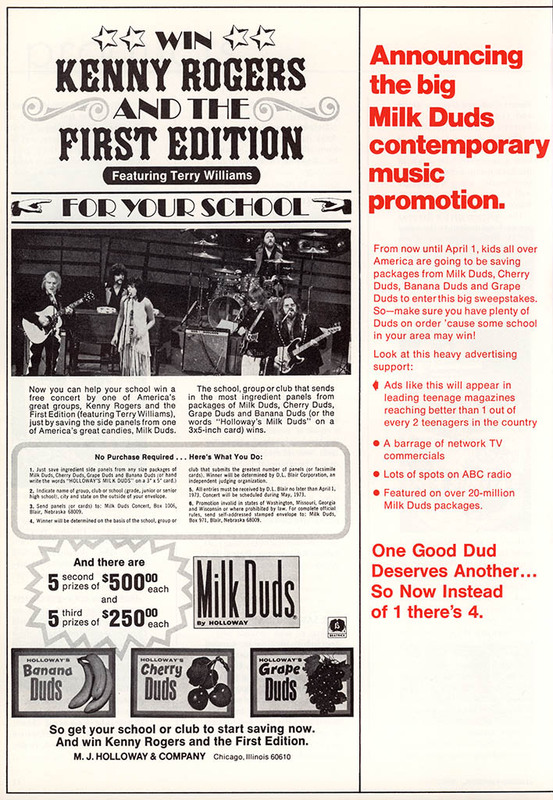 Fortunately for me, I had a break in the case earlier this year when I uncovered a candy industry trade ad from 1973 that showcased the original three flavored Dud offerings: Grape, Cherry, and Banana. That ad ALSO features a pre-“The Gambler” Kenny Rogers – how cool is that? With that ad uncovered, I now possess concrete evidence of what the original flavored Duds assortment was. 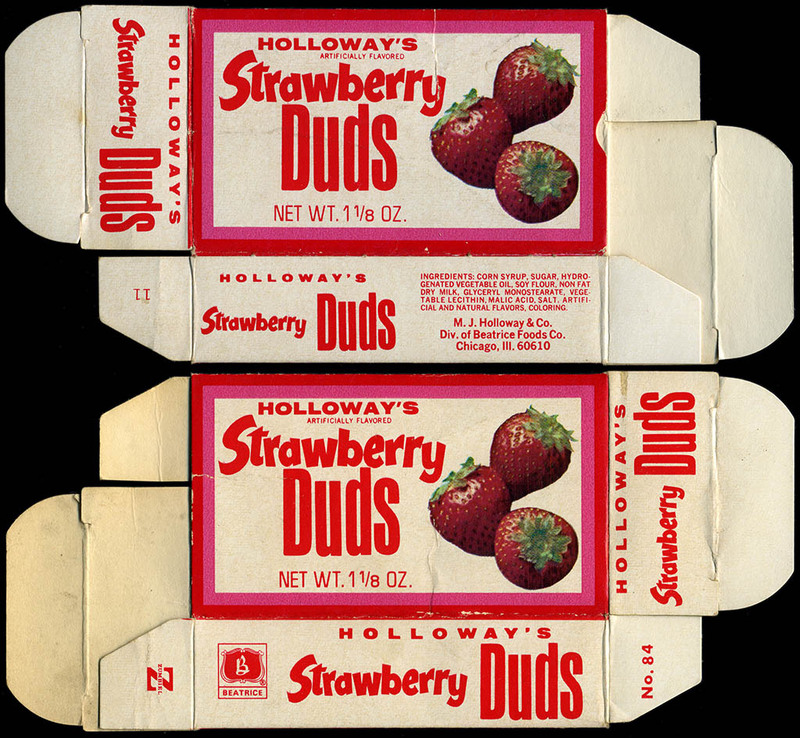 But since I also know that Strawberry Duds were made at some point, the possibility remains of there having been additional variety of fruit-flavored Duds than just the four I’ve found solid evidence of thus far. So that’s that’s a pretty big discovery – but I still have more cool things to share with you today. 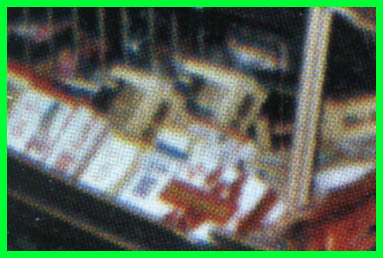 First up, a flavored Duds box that has never been shown anywhere else on the internet before today. 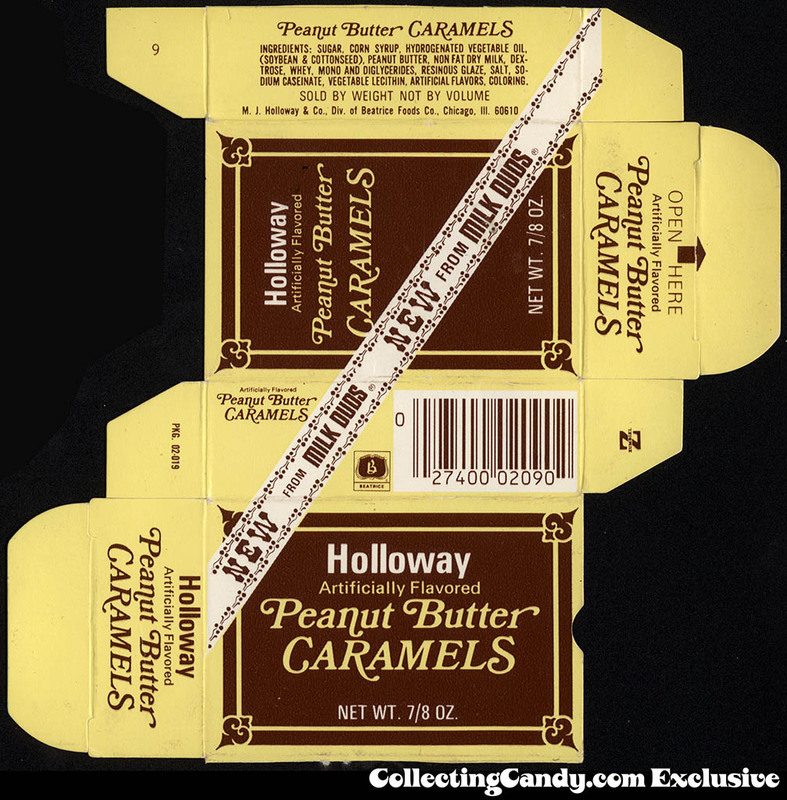 It’s one of today’s four CollectingCandy.com Exclusive Premiers – Holloway’s Cherry Duds! Beyond just trying to suss out what flavors of Duds there were, I’ve also been keen on determining when and where these exotic Duds were available, and I’ve learned a lot. 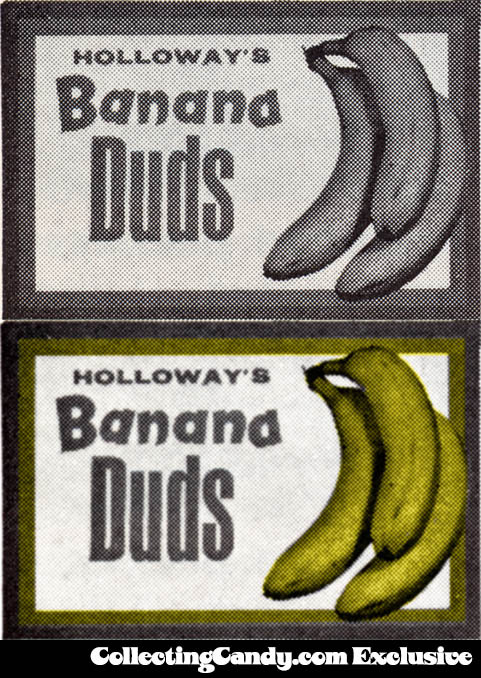 I’ve determined that fruit-flavored Duds were around during a greater period than I had initially guessed, and apparently were a nationwide product at least part of the time (I’d speculated they were a test-market item only). Based on evidence I’ve gathered, I can state that fruit flavored Duds were first introduced in the late-1972-to-early-1973 period, and were on shelves in 1977 as well. I can’t say that they were produced and available across that whole span of years, but at least I know that they were around for two windows of time (my 1975 Photo Hunt image allows me to strongly speculate that they were sold throughout the entire 1973-1977 period). Banana, Grape, Cherry, and Strawberry; that’s the story-so-far on fruit-flavored Duds. But there are other obscure Duds that you haven’t heard of, so let’s get to talking about those. As you can see, the Duds family had far more reach than you might ever guess. But I’ve still not shown you everything I’ve got. Next up is a Duds variety I’d never had an inkling of until this year. 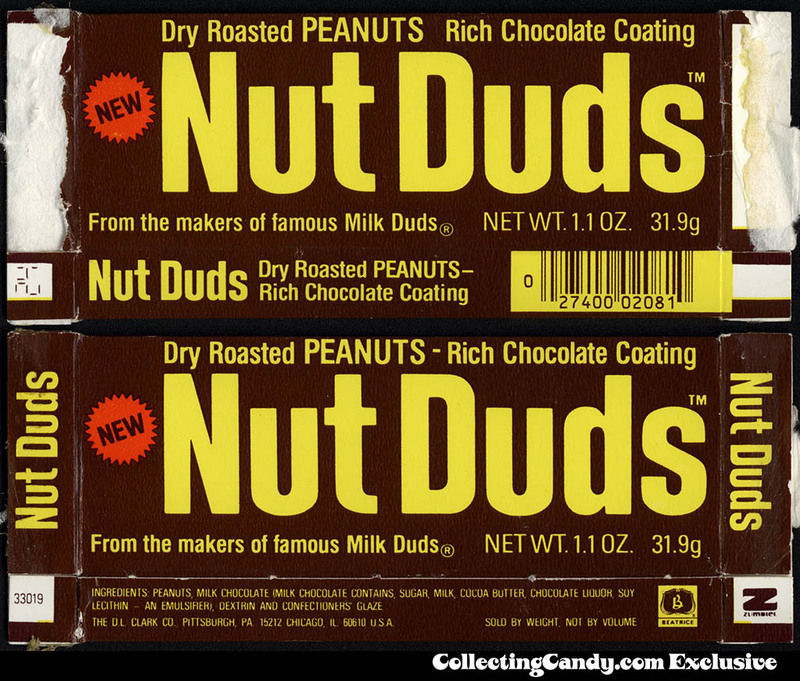 It’s got a name that might have you chuckling, and it is today’s fourth CollectingCandy.com Exclusive Premiere: Nut Duds! I gotta say, today’s post has been a lot of fun for me; getting to share four exclusive premieres is more than I’ve ever done in a single post. And these aren’t ordinary exclusives; these are pieces that in some cases I’ve spent years hunting for. But I’m still not done yet. I’ve got one last exotic Duds to share. 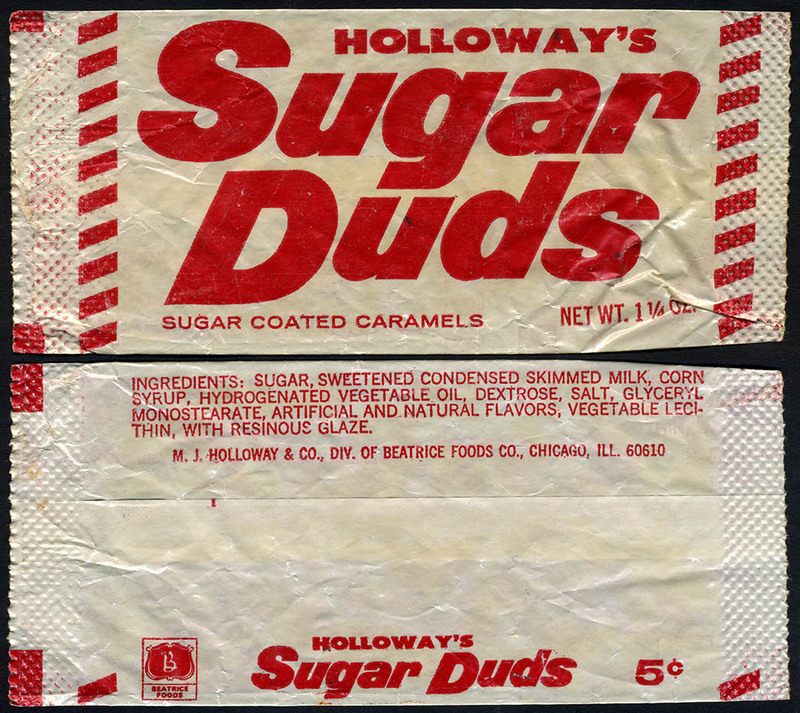 Here are Holloway’s Sugar Duds! So that’s everything I’ve got to share today on what is one of my all-time favorite confectionery topics: Milk Duds’ brand extensions. I’ve uncovered a lot about these in the past several years, which I’ve collected and am thrilled to be able to document here today. And I plan to continue to uncover answers to the “exotic Duds” mysteries that still remain. So this fun saga continues, and when I learn more, I’ll be reporting it here to you. And that’s it for today. This entry was posted in 1970's, 1980's, Chocolate and tagged Apple Duds, Banana Duds, candy collecting, candy collection, candy collector, candy wrapper collection, candy wrapper collector, Cherry Duds, collectible, collecting candy, confectionery, confections, flavored Duds, fruit-flavored Duds, Grape Duds, Holloway, Maple Duds, Milk Duds, Nut Duds, Orange Duds, packaging, Strawberry Duds, Sugar Duds, sweets, vintage candy wrapper, wrapper. Bookmark the permalink. 17 Responses to Milk Duds’ Exotic Brand Extensions – Saga of the Fruit-Flavored Duds and More! The banana were by far the best of the fruit flavored DUDS. I was addicted to them back in ’73. I was 9 living in upstate New York. I remember eating the Strawberry Duds and maybe the Grape. They were tasty. My memory is vague but I think they were around for a while. I am sure I ate them a few times. Great post today! I really want to try those fruit Duds. I had no idea those were ever around. Before my time, sadly. I remember all these,but thr banana.I also seem to recall eating Orange Milk Duds at the time.Tey were good. Banana Duds were FANTASTIC! -at least, when I was 15. I remember cherry and grape, but the banana duds were my favorite, by far. I REALLY want to thank you for this article. I am 45 years old and I have been telling people for years that my favorite candies as a child were Cherry flavored Milk Duds . I have been politely told I was mistaken, lying or crazy. With the recent re-release of Strawberry flavored Duds, I was told and almost convinced that maybe that was what I had. I recognized the Cherry Dud box immediately!! It would have been around the mid 70s and I only remember being able to get them at the Cooper Theater in downtown Colorado Springs. Thank you for confirming and returning a small but special piece of my childhoood! I remember all those dud flavors – banana, cherry, and grape…I also recall that the original Black Cow (similar to the Sugar Daddy, but covered in something passing for chocolate) was also offered in at least a banana version, and I wouldn’t be surprised if there was also grape and cherry. Thanks for the comment. Actually, I can confirm that the following fruit-flavored versions of Black Cow: Banana Cow, Purple Cow, Pink Cow and Orange Cow. Pretty neat! The banana duds are my favorite candy of all time! The makers of milk duds must reproduce! I remember them at dear valley camp, and were the best, (had grape also). I am 45 and was just a toddler, but one of my most treasured memories of the camp. Like a previous poster said, banana was the best! 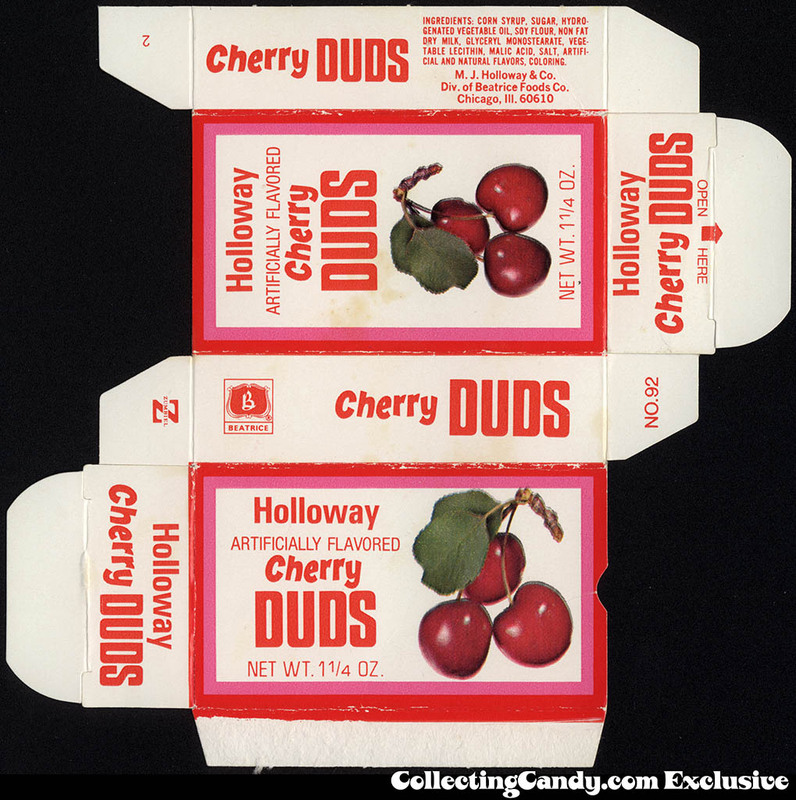 I am 45 and remember eating these fruit duds as a kid in the mid 70s. I found this website after googling “strawberry milk duds,” because today I had a candy called Goetze Strawberry Cow Tales, which reminded me almost exactly of the flavor of the Strawberry Milk Duds from 40 years ago. I remember the Grape, Cherry, and the Banana ones used to get them at he Blue Ridge theater when I was a kid. God I wish they would bring them back along with a lot of other candies that were around back then. Completely agree! Banana were the best! I’ve thought about these over the years & mentioned to my husband who had no memory of them. They were a favorite. Thanks for sharing! As a kid growing up in southern Colorado in the 1970s I remember how my brothers and I just loved the flavored Milk Duds! I don’t remember the strawberry ones, but I remember that one brother liked the Banana Duds, one liked the Grape Duds, and I liked the Cherry Duds. I think they were only around for a year or two. Over the years the only candy I have found that comes a bit close to the taste of the Grape Duds are the Grape Frooties that are still being made by Tootsie Roll. The grape flavor of that candy is awesome! I tried the Cherry Frooties once but they seemed kind of bland.